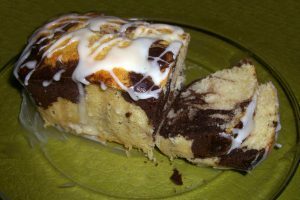 During my hunt for some recipe ideas and suggestions for banana bread, I came across a Marble Cake with White Chocolate Glaze recipe in The Martha Stewart Baking Handbook. It looked really, really good, so I decided to make it – with my own variations, of course. I’ve also been into miniaturising recipes for full-size quick breads, because mini-sized ones are easier to distribute, and most of my baking gets given away. 1. Preheat the oven to 350oF. Generously butter a loaf pan. 2. Whisk together the flour, bakingg soda and salt and set aside. 3. Beat butter and sugar on medium speed until fluffy, about 5 minutes. Add egs, one at a time, beating until combined after each addition. Mix in the vanilla. Add the flour mixture in 2 batches, alternating with the buttermilk and beginning and ending with the flour. Set aside 1/3 of the batter. 4. In a bowl, mix together the cocoa powder and boiling water until smooth. Stir into the smaller portion of the cake batter and mix until well-combined. 5. Spoon the 1/3 of the white batter into the prepared loaf pan. Then make a checkerboard pattern on top with the remaining white batter and the chocolate batter. Run a knife through to create a marbled pattern. 6. Bake, rotating pan halfway through, 40-50 minutes, until a toothpick inserted into the center comes out clean. Transfer to a wire rack to cool in pan 10 minutes, then turn out onto the wire rack to cool completely. Glaze. Whisk together the buttermilk and sugar. Sitr in the white chocolate and mix until smooth.